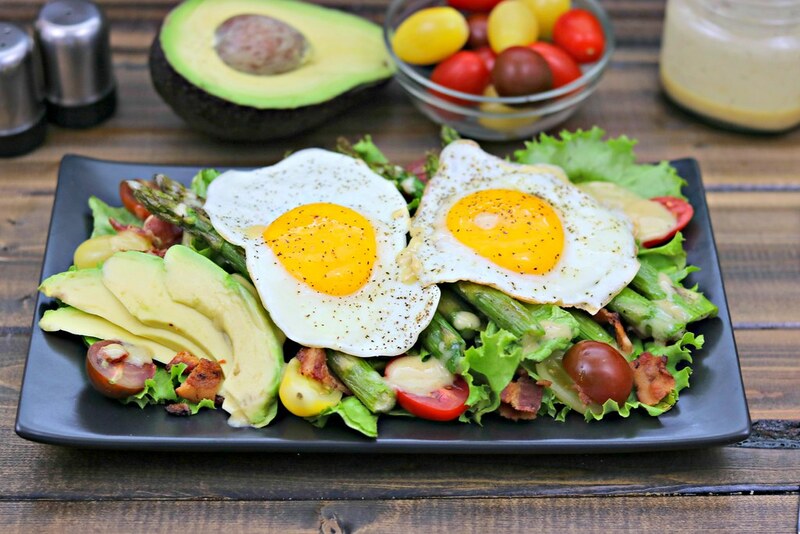 This Egg & Asparagus BLT Salad combines all the goodness of a BLT into an amped up salad topped with perfectly cooked asparagus and over-easy eggs for the entree salad of your dreams. Welcome to day two of #BrunchWeek! There were some amazing recipes shared yesterday, so if you missed them, be sure to check them out! The links to all the posts are at the bottom each day’s post. You can see yesterday’s here. And now for today’s little beaut. 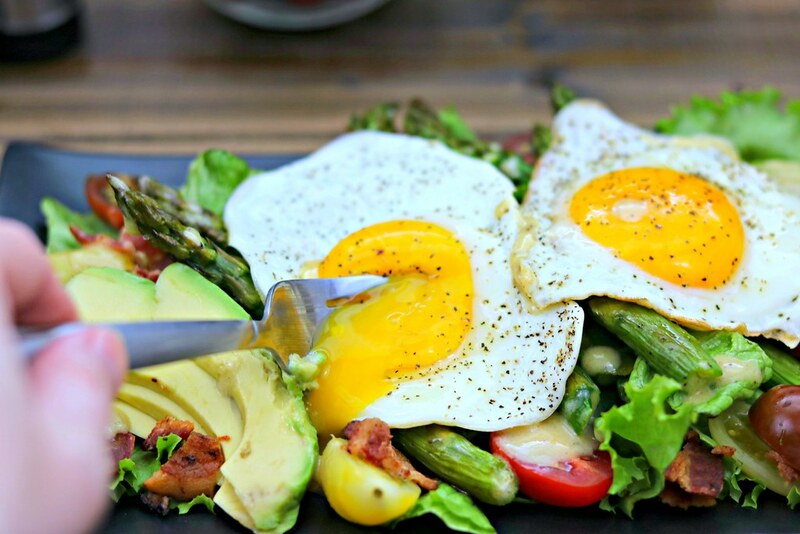 I was introduced to an egg & asparagus salad a few year’s back when I did a guest post for my dear friend Sarah’s six year blog anniversary. It was (still is) one of her favorite meals, and I was happy to make it in her honor! When I was trying to decide what recipe to make, to highlight the delicious asparagus from Michigan Asparagus, I immediately thought of making a kicked up version of that salad. That also meant I got to use more Eggland’s Best eggs and some crisp romaine from Cal-Organic Farms! 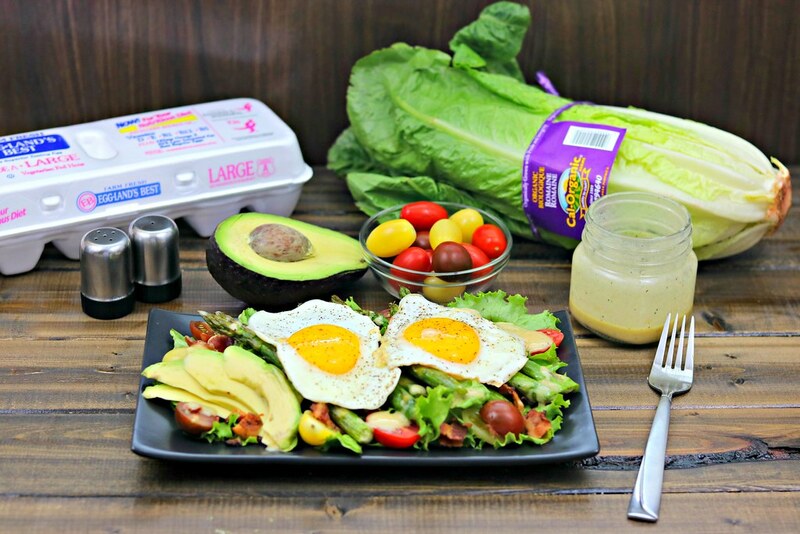 All things BLT, with asparagus, eggs, and a yummy dressing? Yeah, I was all over that in a heartbeat! There’s just something about an over-easy egg, when you break it open and watch all that deliciousness pour out over the other food. Doesn’t even matter what it is, most of the time, it just makes it better. This salad is no different. And the asparagus is cooked so that it is crisp-tender – not mushy – and has just the right amount of crunch with each bite. Add to that the crisp romaine and bacon, creamy avocado, and cherry tomatoes and you have the perfect balance of flavors and textures. Oh, and the dressing? Just the right amount of tanginess to tickle those taste buds. If you couldn’t tell, I kinda love this salad. And the toddler did, too! That, my friends, is one of the best compliments this mama can get these days. Because, finicky toddler. But please, don’t just take my word for it. The weekend is coming…and you need this in your life. Brunch food at it’s best! Be sure to check out this and other amazing recipes from today at the bottom of the post, and if you haven’t already – enter the giveaway drawing!! There are some amazing prizes to be had y’all, from some amazing and generous sponsors!! If you missed the earlier post, you can check out the prizes here. To make the vinaigrette, combine the mustard, vinegar, and oil in a small jar with a lid. Secure the lid tightly, shake until well-combined, and set aside. Meanwhile, heat a skillet over medium heat and cook the bacon until slightly crisp. Remove to a paper towels and allow the grease to drain off. When the bacon is cool, rough chop into bite-sized pieces. To assemble, divide the romaine between two plates, top with half the bacon, tomatoes, asparagus spears, and avocado slices. 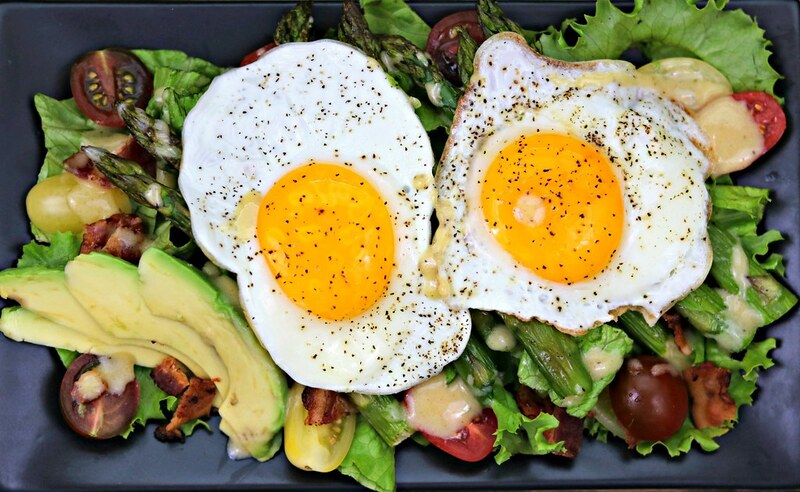 Top each salad with 2 eggs, and drizzle the vinaigrette over the top. Serve immediately and enjoy!